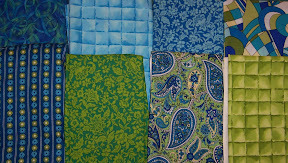 Last month I started making real plans to work on this Sew Fun quilt for my bed. 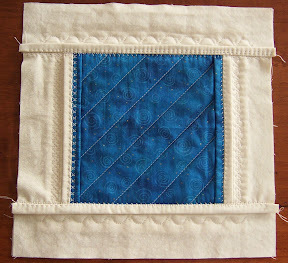 First, I didn't like the grid-like quilting on the center piece of my first practice block, so I stitched simple one-inch wide diagonal channels. This step was completed much faster and I like the result. 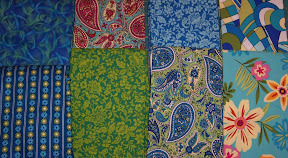 Second, on the side strips I stitched a single row of decorative stitching instead of rows of straight channel stitching. I like this better, too. And it doesn't seem so obvious when I stitch a little bit crooked. I used wash-away basting tape to help hold the folded seams in place and was more careful while stitching them, and I think they look straighter on this second piece than on the first. I haven't bothered to bind this practice piece . . . I may want to add on to it later. 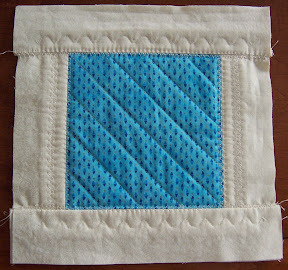 Another decision I've made on this project is to use a bamboo quilt batting, which is supposed to be eco-friendly (though I'm not sure how much better it may be for the environment, since bamboo still needs to be processed with chemicals to make it into usable fibers). I also have a cotton 80/20 blend batting, so I may change my mind again on this if the practice block with bamboo batting doesn't work for me.